To move all the cards to the tableau. 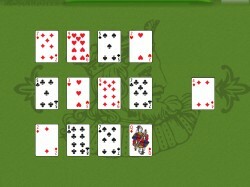 - 12 tableau piles - Place cards from the stock onto a card in the tableau that totals eleven (Ace-10, 2-9, 3-8, 4-7, 5-6). Face cards (Jacks, Queens, and Kings) block any further play and can be placed on any non face card pile. - stock (right) - Top card is available for play on the tableau. To discard all the cards. - 20 tableau piles - the top card is available for play. Pair the top card of the stock with the top card of a pile in the tableau where the rank adds to fourteen (K-A, Q-2, J-3, 10-4, 9-5, 8-6, 7-7). - stock (bottom right) - top card is available for play on the tableau. If all the cards from the stock are played to the tableau, then the backward part of the game begins. Any two cards in a tableau pile whose rank adds to fourteen are discarded to the waste. - waste (top right) - where paired cards go out of play when stock becomes empty.